I hope you have been enjoying the five part series on French figure skating history as much I have writing it... the wine and cheese have been almost as fantastic as the villas and vineyards on our little virtual journey and I want to thank you for donning your berets and going on this little journey through time with me! Part five - the final part - of this series explores the story behind two of my favourite ice dance programs of all time: "Missing" and "Missing II" from World Champions Isabelle and Paul Duchesnay. When PJ Kwong interviewed me for Open Kwong Podcast, she asked me what five of my favourite skating performances of all time were. Like a complete idiot, I completely drew a blank and forgot to mention Isabelle and Paul Duchesnay's brilliant "Missing" free dances which along with (of course) Jayne Torvill and Christopher Dean's "Bolero" I personally consider to be two of the best and most important ice dance performances of all time. I'm pretty lucky to be able to say that I live a ten minute walk from (and get to see tons of great skating in) the rink where the Duchesnay's earned the world silver medal and five perfect marks of 6.0 for artistic impression in 1990. I have wanted to delve a little deeper into the story behind these free dances for some time because not only were these programs iconic but the message behind the movement was and is an important and political one. In 1987, Jayne Torvill and Christopher Dean first performed a stunning program to music from "Panpipes Of The Andes" skated in dim lighting and giving the idea of two people in despair on the run. Torvill talked about the program in the duo's 1995 autobiography Facing The Music: "One thing that required our attention was Chris’s response to some Andean music, which reminded him of the terrible things - particularly the officially sanctioned kidnappings - that had been happening in Chile and Argentina in recent years. The subject was very much in the air after the Falklands War, and more recently the Costa Gavras movie, Missing. Chris saw in his mind those who had vanished, the fathers, mothers, husbands, wives, lovers, friends and children, and devised a series of movements linking two people who could be seen as friends or brother and sister, confronting authority, cowering before it, searching for lost loved ones, and ending where they started, in limbo." When Dean began choreographing for his future wife Isabelle Duchesnay and her brother Paul, he translated he and Jayne's well received professional program to an "amateur" competitive free dance for the team, again using the "Dolencias" music as part of the dance, the burnt red dress and the theme of these sanctioned kidnappings in South America. These kidnappings have been termed by international human rights law as 'forced disappearances'. Around the time of Argentina's Dirty War, between 9000 and 30000 citizens including everyone from left-wing activists to militants, students, journalists, trade unionists and alleged sympathizers (and their families) were held in clandestine detention camps or other secret locations by the country's government. In what became known as the Caravan Of Death, many of the captives were heavily drugged by Pinochet security forces, put on aircrafts and thrown out while still alive into the Atlantic Ocean. Without bodies, the Argentinian government was easily able to dismiss rumours of any knowledge or involvement these people's disappearances or deaths. It was really disgusting business and was very politically significant at the time for Torvill and Dean and the Duchesnay's to bring this story to the world's attention using the ice as their medium. The Duchesnay's actually won the free dance at the 1990 Worlds here in Halifax ahead of Marina Klimova and Sergei Ponomarenko but a third place finish in the compulsory dances and a second place in the original dance kept them underneath the Russian pair. The "Mirror Image" free dance that Isabelle and Paul skated at the 1991 European Championships wasn't super well received there and they quickly set to work with Dean in creating a new free dance - a sequel to "Missing" that continued the story where the first program left off. This time things went differently for the Canadian turned French ice dance team and they won both the original and free dances to take the World title that year in Munich. In 1991, they fittingly entered the ice in the same position which they closed their free dance in Halifax. Again skating to music from "Panpipes Of The Andes", their choreography was just as innovative and unmistakably Christopher Dean. They made use of that wonderful repetition in three's that Dean is famous for using and that final pose with Paul on the ice holding an outstretched Isabelle (almost as if she was in flight) is really 'the stuff of memories'. After turning professional in 1992, the Duchesnay's toured in France and in North America with Stars On Ice and the Tom Collins tour but their professional career came to a halt in late June 1995 when Paul suffered a broken disc in his back. Any chance of a comeback was put to rest when a year later he was a victim in a near fatal accident while rollerblading. Paul then moved to Florida with his parents to start a family business and Isabelle tried her hand at commentary. In his wonderful book "Ice Cream". Toller Cranston opined that "after the Duchesnay's left the scene, ice dance declined dramatically. Today it has become low-level schlock. Its future is in jeopardy. This mystical art will be salvaged only if skaters like Paul and Isabelle carry the creative torch and illuminate the minds and passions of future ice-dance couples." Today, both Isabelle and Paul have largely chosen to stay out of the public eye and as much of a shame as that is for the sport, I for one certainly respect their decision. That said, in an age where skaters today seem cautious of using music with lyrics after finally being ALLOWED to do so after literally over a hundred years, it almost seems like a foreign concept that many of today's skaters might be daring enough to use their competitive skating programs as a vehicle to share a political message. Skaters like the Duchesnay's and Katarina Witt WERE brave enough to take on very adult and political themes with their programs and choreography and I personally hope we'll see another skater in the future with that same interest - or even daring I guess is the right word. In these strange days of missing airplanes, civil unrest, questionable weather, water shortages and people continuing to take the mass media at face value, one has to reminisce on Isabelle and Paul Duchesnay's brave choice to put "Missing" and "Missing II" out there to the world on an unlikely stage and smile. Did you enjoy "Missing: The Story Behind The Iconic Ice Dances"? In order for this blog to reach a wider audience, I could sure use a little help. All you have to do is "LIKE" the blog's Facebook page at http://www.facebook.com/SkateGuard for instant access to all of the new blog articles, features and interviews as they are made available. I also share daily updates and headlines from the skating world, videos and much more that's not here on the blog, so if you love figure skating as much I do, it would really be rude not to get on that inside edge! You can also follow all of the fun along on Twitter at http://twitter.com/SkateGuardBlog. If you know someone who loves skating, tell them! It's all about getting a dialogue going on! Exhausted as I am from the whirlwind virtual tour of French figure skating history on Skate Guard this week? Never fear, more is here. You're going to have to stock up on MORE wine, MORE cheese and use your imagination to take you back to the Eiffel Tower in the days of discothèque because part four of this series takes us to the not so distant past that predated the rise to popularity of French skaters like Isabelle and Paul Duchesnay, Philippe Candeloro, Laetitia Hubert, Surya Bonaly and Marina Anissina and Gwendal Peizerat in the nineties... to figure skating in France in the seventies which proved to be an absolutely FASCINATING time full of familiar faces! In 1968, Patrick Péra had followed in the footsteps of two Frenchmen who had each won World titles in the sixties: Alain Giletti and Alain Calmat. He won the Olympic bronze medal that year at the Grenoble Olympics and would go on to win three European and World medals and a second Olympic medal at the 1972 Games in Sapporo. North American audiences seem to unfortunately know so little about him. There's quite a bit TO know in fact. In the late sixties, Péra actually became involved with former skater and renowned designer Vera Wang, who moved to Paris, enrolled at the University Of Paris-Sarbonne and had a brief relationship with him before returning to New York City in 1970. Péra was coached by the legendary Jacqueline Vaudecrane, who herself was a two time French Champion in the thirties and a former student of The Brunet's. He was sent to New York City to train with his coach's former coach Pierre Brunet for a time, bringing three generations of French skaters together in doing so. Today, he's a successful banker in Milan, Italy. 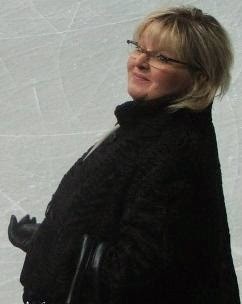 Anne Sophie de Kristoffy, who won three French ladies titles from 1978 to 1980 became one of the country's best known skating commentators, covering the sport on TF1 as a journalist before taking over the direction of TF1 in 2008. In 1974 and 1975, France's men's champion was none other than Didier... yes, that Didier... Gailhaguet, the perennial President of France's Federation that last year was elected for yet another term despite a challenge from Olympic Gold Medallist Gwendal Peizerat for the throne. Another embattled name from French figure skating who would join Gailhaguet in standing on the French podium in the seventies was 'the French judge' Marie-Reine Le Gougne, who won the bronze medal in the ladies event in both 1975 and 1977. After winning two French titles in the late sixties with Fabienne Etlensperger, Jean-Roland Racle won another five more French pairs titles with two more partners: Florence Cahn and Pascale Kovelmann. Why does the name Jean-Roland Racle stand out? Racle turned to coaching in Boulogne-Billancourt and was the longtime coach of Laetitia Hubert as well as a coach to Sarah Abitbol and Stephane Bernadis and Line Haddad and Sylvain Prive. He has also held various roles in the FFSG (French Federation) over the years. No rundown of the names, names, names of French figure skating in the seventies would be complete without mention of Muriel Boucher-Zazoui. The famous French ice dance coach was herself a competitive ice dancer and won three French titles with former partner Yves Malatier beforing turning to coaching and working with such fabulous ice dance teams as Marina Anissina and Gwendal Peizerat, Isabelle Delobel and Olivier Schoenfelder, Nathalie Péchalat and Fabian Bourzat and Marie-France Dubreuil and Patrice Lauzon. Stay tuned for the final part of this series on French skating history VERY soon - it's certainly a grand finale to say the very least! If you enjoyed this feature on French figure skating in the seventies... I've gotta ask. Are you following Skate Guard on Facebook? Check out and like http://www.facebook.com/SkateGuard or visit http://skateguard1.blogspot.ca for all of the latest articles, reviews, interviews and musings that are on the go. As well, you can also follow me on the Twitter at http://twitter.com/SkateGuardBlog. I tweet about figure skating a lot and am always happy to answer your questions and ask many of my own. Think celebrating my birthday yesterday left me too tired out to get another blog out for all of you today? Think again, sweetie. Time to reload those picnic baskets with more wine, fromage, grapes and your favourite amuse-bouche and get ready for part three of a five part series on skating history in France... a look at the country's early ICE DANCING history. Although history would have Great Britain high on the list of pioneers in ice dance, ice dancing as a sport was developing at a rapid pace in France at the same time... and the story of how it came to prominence in that country is really quite compelling. The early roots of organized ice dancing in France date back as early as 1896, when the Skating Club of Paris was founded. In May of 1922, another skating club in Paris merged with Skating Club of Paris and became known as The Club Of Winter Sports. The club was affiliated with the French Federation Of Skating, which became known as Fédération française des sports de glace (FFSG) in 1943. At The Club Of Winter Sports, both figure and free skating and ice dancing were practiced. One of the most influential members of this skating club was an avid ice dancer by the name of Jean Potin. He was the grandson of Felix Potin, who was one of the most influential and successful businessmen of the nineteenth century. With the support of many of the ice dancers at The Club Of Winter Sports, Potin decided to create the Elysee Skating Club in January of 1937. It was the first skating ice dance only skating club in France. Recognizing the British were authorities in the area of ice dancing at time, Potin traveled to London, England in September of 1937 with one of the two conductors of The Ice Palace which housed the Elysee Skating Club to study both compulsory dance technique and the musical side of things. While there, Potin learned of new dance patterns which were unknown in France at the time, having straight lines and open dancing holds. He also contacted several British ice dance coaches hoping to convince them to teach in Paris. With the outbreak of World War II, ice time at The Ice Palace was sporadic and Potin's work to develop ice dance in France was effectively stalled. Sadly, Potin almost made it through the war but died as the result of an accident on March 18, 1945 and never saw the result of his pioneering work. Henri and Jacqueline Meudec picked up where Potin efficaciously left off. 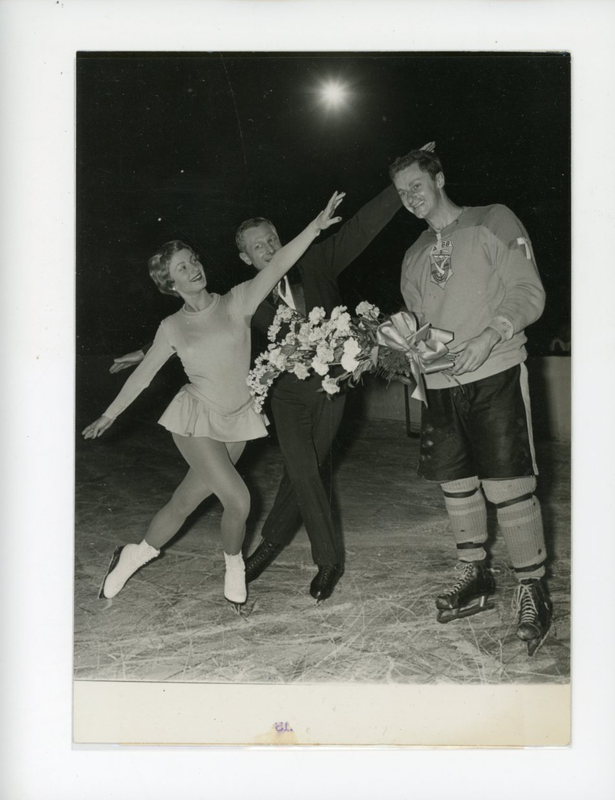 The husband and wife ice dance team won the first French ice dance title in 1948 and went on to chair the ice dance club and act as international referees and judges. In 1952, Henri Meudec created The International Committee Of Dancing On Ice (CNDG) a few weeks before the 1952 World Championships which were held in Paris. He went on to judge the ice dance event which was won by Britons Jean Westwood and Lawrence Demmy. Although they competed against each other with different partners at the 1953 French Figure Skating Championships, Fanny Besson and Jean Paul Guhel teamed up to win the French ice dance title from 1954 to 1956. They were the first ice dance team from France to ever compete at the World Championships when they finished seventh of fifteen teams at the 1955 World Championships in Vienna, Austria. 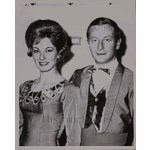 With Christiane Guhel, Jean Paul Guhel would go on to win another five more French ice dance titles and the country's first World medal (a silver to Eva Romanová and Pavel Roman) in 1962. 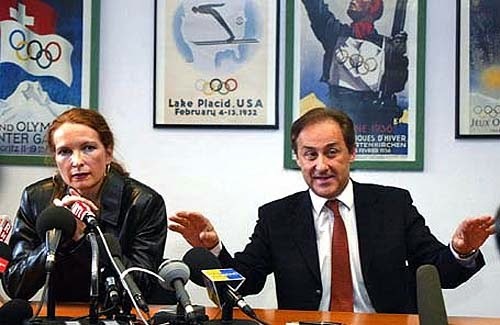 Christiane Guhel followed in Henri and Jacqueline Meudec's footsteps and served as President of CNDG and was responsible for bringing three time European Medallist Roger Kennerson of Great Britain to France to work with the country's ice dancers. A former student of Betty Callaway, Kennerson was held in high esteem and among his students was none other than Muriel Boucher-Zazoui, a two time French champion in her own right who went on to coach a who's who of French ice dancing including Marina Anissina and Gwendal Peizerat, Nathalie Péchalat and Fabian Bourzat, Isabelle Delobel and Olivier Schoenfelder, Marie-France Dubreuil and Patrice Lauzon and Anna Cappellini and Luca Lanotte, Speaking of Gwendal Peizerat, his father Pierre Eugene Peizerat served as General Secretary of the FFSG and was also a pioneering figure in supporting the same discipline that would see his son win Olympic gold in 2002. Thanks largely to the pioneering efforts of Potin, The Meudecs and The Guhels and also the innovation and breaking down of walls of The Duchesnays (who we'll come back to later in this series - don't you worry! ), France have been leaders in this discipline for decades. With a whole new generation of French ice dancers on the rise led by the CURRENT World Champions Gabriella Papadakis and Guillaume Cizeron, it appears the future looks as bright as the past illuminated. Stay tuned for parts four and five our little virtual trip through French skating history - you do NOT want to miss them! In order for this blog to reach a wider audience, I could sure use a little help. All you have to do is "LIKE" the blog's Facebook page at http://www.facebook.com/SkateGuard for instant access to all of the new blog articles, features and interviews as they are made available. I also share daily updates and headlines from the skating world, videos and much more that's not here on the blog, so if you love figure skating as much I do, it would really be rude not to get on that inside edge! You can also follow all of the fun along on Twitter at http://twitter.com/SkateGuardBlog. If you know someone who loves skating, tell them! It's all about getting a dialogue going on! Grab your berets, baguettes, wine bottles and skate guards... because this week the blog will be featuring five back to back blogs taking a look at skating history in France! We start today by going back - way back - to Napoleonic France. 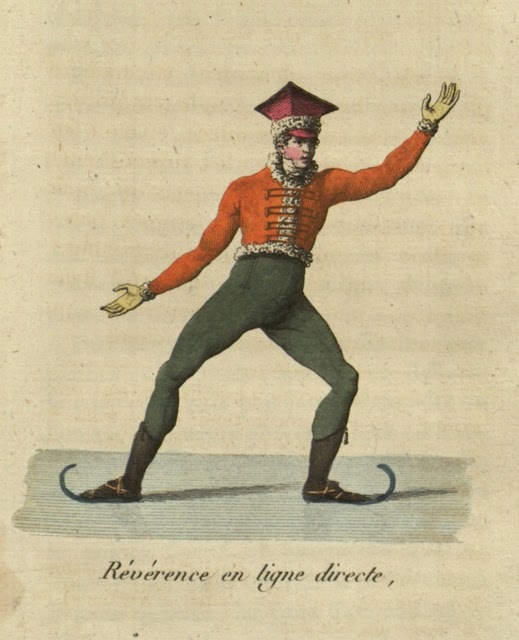 These days, not many instructional books on figure skating have a chapter on "the dangers of skating" providing advice on what a safe temperature of ice to skate on is or how to pull yourself safely out of the water should you fall through, but 1813 was a different time and Napoleonic France was a different place. 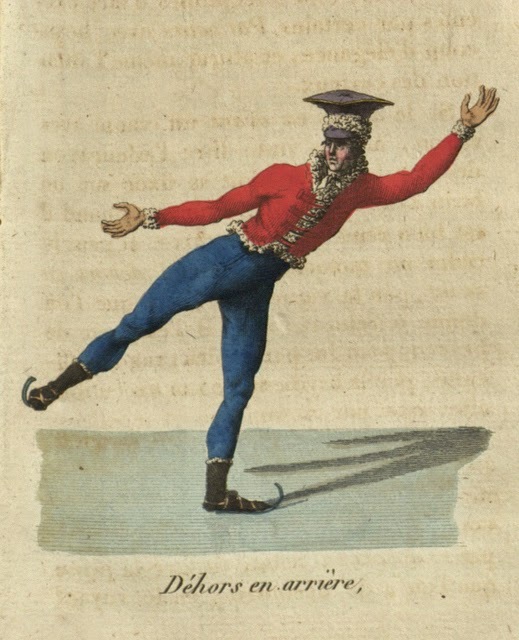 Over half a century before Jackson Haines revolutionized figure skating with his icy pilgrimage to Europe, France's Jean Garcin penned "Le vrai patineur, ou Principes sur l'art de patiner avec grâce (The true skater, or the art of skating with grace)". "Le Vrai Patineur" was an instructional book created in an effort to popularize ice skating - ice skating with a little grace at that - to the French masses during a tumultuous time in gay Paris. 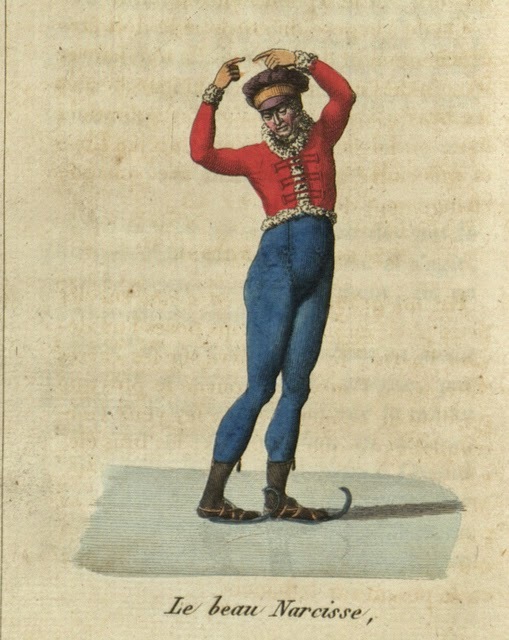 It is considered to be one of the first books devoted entirely to figure skating in history, its predecessor being the British "Art Of Skating" book written by Robert Jones in 1772 and was developed as a result of Garcin's involvement in a skating fraternity known in France as the Gilets Rouge (red waistcoats) who emphasized artistry over athleticism when it came to venturing out on the ice. Their credo was artistic sophistication and Garcin's book was dedicated to Geneviève Gosselin, the premier dancer at the Academy Of Music in Paris at the time. 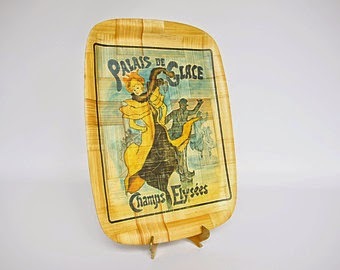 Parisians of the era travelled in droves to the frozen fields outside of the city near Paris at the hamlet known as La Glacière (the Glacier, then near Gentilly) or to the Canal de l'Arsenal. Skating in France during that period was generally considered a 'gentlemen's sport'. Their female companions would sit in sleighs on the sidelines in sleighs and carriages designed like gondolas, as swans with wings abreast or as crocodiles with their mouths open and would join their male friends in between bouts on the ice at beverage tents pitched around the natural rinks for a nice stiff cocktail and perhaps... a good Christian cigarette. Later in the century, the best place to skate in France would be a private skating club within Napoleon III's own court called the Cercle des Patineurs, named after a pond constructed in a secluded portion of the Bois de Boulogne called "la pelouse de Madrid". The skating club was personally endorsed by the Emperor, who would host extravagant skating parties on the pond. French author Arsène Houssaye (who attended many of these skating parties) wrote in 1885 about the grand and very exclusive affairs: "One could imagine that the Marshals' Salon on the day of a ball had been magically transported to the Bois de Boulogne. The Emperor and the Empress, all of their esteemed court; the ministers, the ambassadors, their coterie from the Tuileries and Compiègne would all relocate themselves there, at times beneath the fog of three o'clock, at times under the evening stars accompanied by paper lanterns." In his 2003 essay "From place to espace: Napoleon III's transformation of the Bois de Boulogne", John S. Hopkins talked more about The Cercle des Patineurs and Napoleon III's interest in skating: "The Emperor's interest in skating spread throughout Parisian society, although the Cercle des Patineurs was off limits to most. Some people tried skating on the Grand Lac, but the depth of the water and successive mild winters often made that a dangerous proposition. The Cercle des Patineurs remained the best place to skate and the private haunt of the court. Indeed, within the international circles of high society, the complex earned the sardonic nickname, "chez les Happy Few." Further evidence of the private nature of the space may be found in the travel memoirs of Americans who frequented the Bois de Boulogne during the Second Empire. Accomplished world travelers such as Charles Warner, John W. Forney, and Junius Henri Browne reported at length on the tours des lacs and the races at Longchamps yet made no mention of the Cercle des Patineurs. Given the highly restricted nature of the place, it is likely that these foreign writers never saw it. Napoléon III's use of the Cercle des Patineurs transformed a simple skating club and pond into a space as private, exclusive, and official as any room in the Tuileries Palace." I think it suffices to say that Jean Garcin's efforts to popularize ice skating in France as an art and social activity paid off royally. In his book, Garcin gives an account of the crowds gathered to skate at the Canal de l'Arsenal in the early 1800's: "men of every age and class were there, the most experienced competed in agility, whilst others clung desperately either to their neighbours or to their valets in an attempt to keep their balance." His illustrations and writings aimed to raise skating to the prominence of a serious art with its inspiration from dancing. He included a large number of 'steps' to which he gave names such as the Renommée (fame), the Saut du Zéphyre (the zephyr's leap) and the Pas d'Apollon (the step of Apollo) and the Roi de Rome (King of Rome). Unlike Jones in "Art Of Skating", Garcin placed equal importance on skating forwards and backwards and thus laid important groundwork for many of the figures skated in that day. Garcin's book was praised in esteemed French novelist and playwright Honoré de Balzac's "Illusions Perdues" and served as important groundwork to the later efforts of Haines and many others who would effectively change figure skating from the 'old boys club' it was then to the balance of compulsory figures and free skating and later, the 'free skating only' sport that we marvel in today. It makes you sit back and ponder just where figure skating will be in another hundred years and what Garcin (and Napoleon III for that matter) would think of the twists, turns and twizzles figure skating has enjoyed so many years after "Le Vrai Patineur" was written. I find it fitting and to the credit of many of the wonderfully creative skaters that have been coming out of France for decades that as a result of Garcin and the Gilets Rouge's efforts, France adopted the term 'patinage artistique' for figure skating, which translates to 'artistic skating'. There's simply something very special about the connection the French people have with the ice and it started a long, long time ago. Q: You had some incredible moments in your career skating pairs, including winning the 1996 Canadian junior pairs title after finishing second the previous year, competing at the Junior World Championships and on the Senior Grand Prix and earning a bronze medal at the Nebelhorn Trophy in 1996. Looking back on your competitive career, what moments stand out as the highest highs and the lows? A: Samantha Marchant and I had a good career together. We experienced many highs and of course a few lows. Making the Junior World team was exciting. That was my first international and the first time to wear a blue Canadian team jacket. We had success in junior and one of my proudest moments came in 1996 when we won the junior pair title. In the long, the audience was standing after the fourth element and they were so loud at times we couldn't hear our music. It was an awesome feeling. Turning senior and skating in front of seventeen thousand people at Nationals was a rush. We ended up skating well and made the senior national team. That gave us the opportunity to compete against some legends in pairs skating, like Xue Shen and Hongbo Zhao and Oksana Kazakova and Artur Dmitriev on the senior Grand Prix circuit. That was during the the 1997/98 season. The lowest low also came that year. We did Skate Canada in Halifax and NHK in Nagano. It was a season filled with injury and it took us until NHK to get our skating on track. On Boxing Day, three weeks before Nationals, I broke my hand. We were working on a brand new lift for the short and the pressure from an unfamiliar handhold snapped my fourth metacarpal. It was devastating and I thought the Olympic bid was over. I worked with our team doctor and he came up with a cast on my hand that allowed me the use my thumb and first two fingers. We tried it out in practice and modified some of our tricks. By the time we were at Nationals, we were doing everything again. We opened with our double twist in the short and it was really big - too big - and the catch was too hard to control with my cast. It was over before I knew it. Samantha was gliding backwards but almost on her back. I remember looking up into the audience at that moment and realizing it was over. That moment and the decision to withdraw from Nationals was the lowest moment in my career. That was to be our only shot at the Olympics and we parted ways after that season. Q: You're actually a four time consecutive senior medallist at the Canadian Championships in FOURS skating! How did you get involved in the discipline and is fours skating something you think could or should make a resurgance in skating today? A: Fours was a tradition in our club. The year I started skating with Samantha was also the first time I did Fours. We were paired up with another pair team once we knew we were going to Nationals. That first year we skated with the amazing team of Corey Watson and Tina Muir. It was nice to have another event at Canadians to perform our tricks... an extra run-through on the big rink! Also performing the 'toss' was fun. We skated into what looked like a regular lift entrance but with four skaters. The front man threw the first girl over his head and the second man caught. Then we would continue with side-by-side lifts. Both positions were fun. It could make a comeback if the interest was there. It can be a fun and creative event. It was a nice way to blow off some steam and get the nerves worked out before the long program. Q: The era in which you were competing was one of considerable depth in Canadian pairs skating, with Sargeant and Wirtz, Menzies and Bombardier, Higgins and Rice, Savard-Gagnon and Bradet and Saurette and Fecteau all in contention for senior medals. Was moving up to the senior ranks unnerving or did you enjoy the fight? A: Winning junior gave us lots of confidence and we loved to compete. Moving up to senior was exciting for me. A few years before that my father put a cardboard sign in my window that read "I LOVE TO COMPETE". I didn't think much of it at first. By the time we moved up to senior I relished the challenge and realised that sign had a big impact psychologically. I started skating better in competition then in practice. I definitely enjoy the fight and the rush competing at that level. Q: You're actually from right here in the Maritimes, growing up in Saint John, New Brunswick. Atlantic Canadian skaters have always faced a unique set of challenges in terms of getting their names out there with the best from the rest of the country. What can you share about your beginnings in the sport? A: I was on the ice at two years old but I played hockey until I was ten. Apparently I was a good defenseman who really liked to skate and skate all over the ice. My father suggested I try figure skating. I thought he was crazy but I would try it. Right away, I realized it was the sport for me. It has so much to learn and found I was good at it. I was hooked! I am actually from a small town just outside Saint John called Quispamsis. I loved growing up there. I would practice there most of the year but go away in the summers. Ice time really was in short supply because of hockey. Hockey got most of it so it was hard to train enough to compete with skaters from big training centers. I did make it to Nationals as a singles skater living in New Brunswick but didn't even come close to the podium. When I was sixteen, my parents asked me if I wanted to move away to train. I said yes and moved to Cambridge, Ontario to train at the Champions Training Center. If I would have stayed in Quispamsis, I just wouldn't have been able to train the same hours. I would say that was the biggest challenge in the Maritimes because they do have some good coaches. Q: What were your favourite and least favourite pairs elements? A: My least favourite pair move was the triple twist. Ours was good and consistent. The problem was every time we had a big competition coming up, an errant elbow found my face. I had a tooth knocked out, I was knocked out and had a few stitches sewed into me. Fun stuff. I loved lifts and throws and going fast. Samantha liked to be thrown. We could do all of the throw triples except for flip and axel. The first time we tried throw triple loop she landed it. We actually did throw triple lutz in competition in the Karl Schäfer Memorial in Vienna in 1997. I think I always had a bigger a smile on my face when we did throws then she did. We were known for our speed. It was fun to be able to do the tricks at a high speed. Q: Today, you live in Hong Kong. How has life changed for you since you retired from the competitive side of the sport? 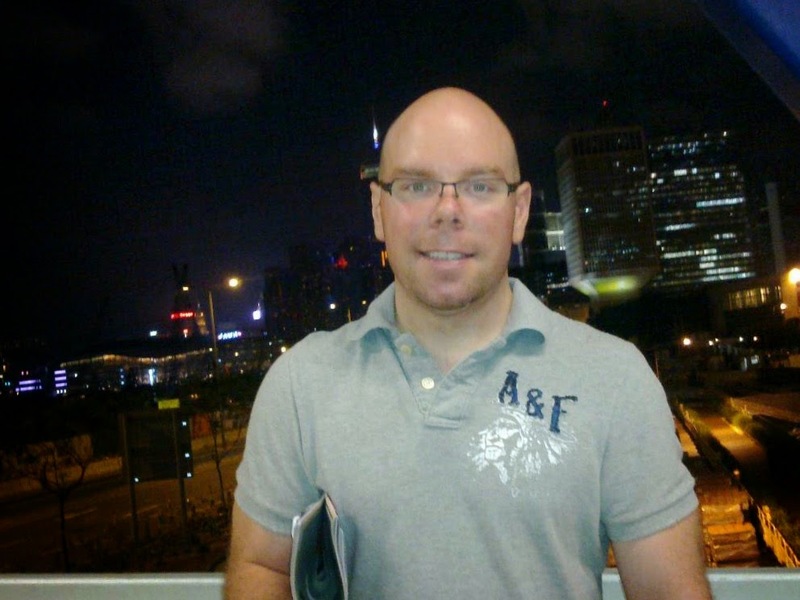 A: I have been living and coaching in Hong Kong now for nine years. I teach figure skating and hockey at a private club called The Aberdeen Marina Club. It is a recreational club and one day I would like to get back into the competitive side of skating. Life in Hong Kong is for sure different than in Canada. It is crowded and hot but fun and convenient. I do other extreme sports I couldn't do as an amateur skater. The main one is downhill mountain biking. A few months ago I broke my tibial plateau biking in Hong Kong and have been sidelined ever since. I do it because it gives me the same kind of rush I got from competing. A: My number one favourite of all time is Gordeeva and Grinkov. From the start to finish, they were amazing. I tend to watch the guy and Sergei Grinkov was so strong under his partner. They made everything look effortless. They are the best pair team of all time. Brian Orser was my favourite skater as a young guy. The first big competition I remember was the 1988 Olympics. The Battle Of The Brian's was legendary. I looked up to him and wanted be able to skate like him. The third one is another pair team, Christine Hough and Doug Ladret. They were the first pair team I saw live. The pair elements they did were amazing and I remember thinking it would be so cool to do that - it must be so difficult! I remember watching them do a death spiral and saying, "wow that looks hard!" I was able to work with Christine Hough. She let me lift her and throw her and it was pretty great. We even did a throw double axel. A: I get my artistic side from my mother. She paints amazing watercolour paintings with emotion you can feel. I manage her website and not many people know that. Check her out at http://www.wandahawse.com. Q: Why should singles skaters take up pairs? A: Because it's AWESOME! It takes a strong skater to be good at pairs. You have to be a jack of all trades. You have to jump, spin, lift, throw... The thing is you get to learn so many tricks that it makes it always challenging and fun. When I started pairs it felt like a completely different sport. You also get to share your experiences with someone else which is very nice. Q: What is the most important lesson skating has taught you in life? A: My parents and skating shaped the person I became. Skating has taught me many things I can use in life. Competing in front of thousands of people is exciting but it's also difficult. I learned to be mentally strong from those experiences. It has helped me stay strong through the tough times. Didn't you just LOVE this interview with Chad? Well, don't just stand there! In order for this blog to reach a wider audience, I could sure use a little help. All you have to do is "LIKE" the blog's Facebook page at http://www.facebook.com/SkateGuard for instant access to all of the new blog articles, features and interviews as they are made available. I also share daily updates and headlines from the skating world, videos and much more that's not here on the blog, so if you love figure skating as much I do, it would really be rude not to get on that inside edge! You can also follow all of the fun along on Twitter at http://twitter.com/SkateGuardBlog. If you know someone who loves skating, tell them! It's all about getting a dialogue going on! Fabulous skating is too fabulous to keep secret. I'm a big fan of the How Stuff Works podcasts and after listening to the Stuff Mom Never Told You episode "Antarctic Women" I remembered someone that I've had on my "to write about" list for quite a while: Norwegian Arctic explorer, scientist, humanitarian, Nobel Prize winner and (you guessed it) skater Fridtjof Nansen. Just to give you a little background on his polar pursuits, Nansen achieved international fame when he reached a northern latitude of 86°14′ during his expedition to the North Pole from 1893 to 1899. Before that, he made the first treacherous crossing of Greenland's interior in 1888. It's incredible stuff! There are countless wonderful biographies of Nansen's exploits as a pioneer in the exploration of the Arctic and Greenland so as much as I'd love to write a whole book on that chapter of Nansen's story, I'm going to try to focus here on a little known part of the Fridtjof Nansen story: his previous incarnation as a skater. Nansen's family was no stranger to adventure. One of his ancestors was Hans Nansen, a seventeenth century mayor of Copenhagen who himself was an explorer of Russia's white sea. He grew up in a well to do family in Christiania (near Oslo) and although he was an immensely intelligent and curious youth, he was also outstanding in athletics. 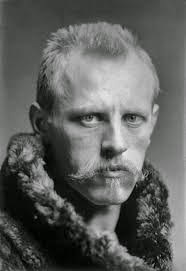 Nansen was not only a talented tumbler and swimmer but he won twelve consecutive Norwegian cross country skiing titles! 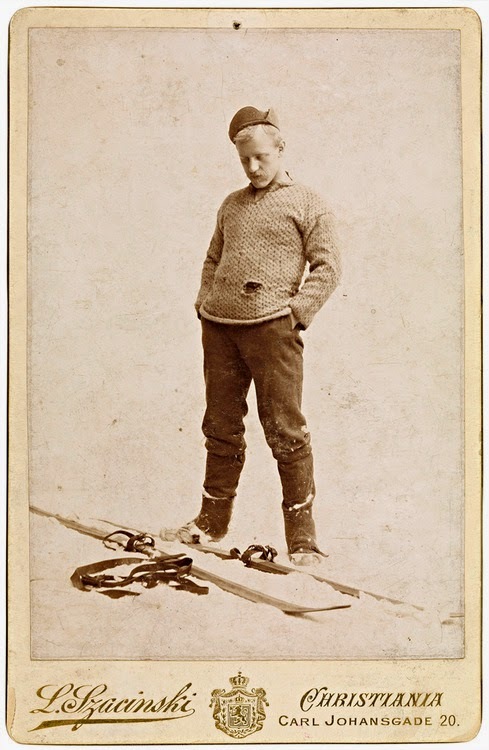 Ironically, his talent for skiing would later prove absolutely essential in his crossing of Greenland in 1888. 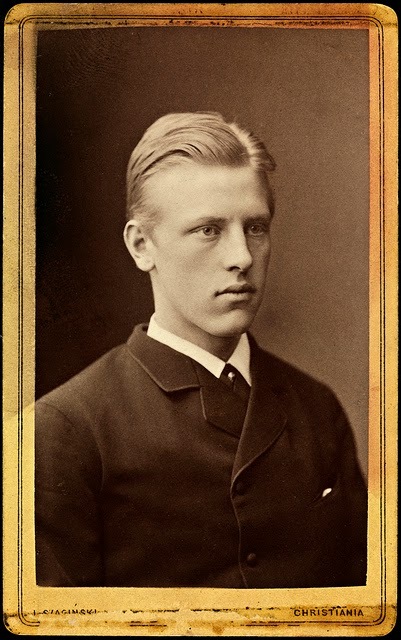 A talented skater as well by all accounts, at the age of fifteen Nansen won a five kilometer boy's speed skating race held in front of a sizable audience on a frozen inlet of the Christiania Fjord. Here's where we throw the metric system out the window for a minute, but don't worry, it's for an exciting reason! After his skating win at fifteen, he went on to break the world record for one mile skating at the age of eighteen in 1879. He'd had a little practice though. Nansen started ice skating at the age of TWO, the same year that the FIRST speed skating competition of any note was held in Oslo. Although at ease skating on ice, he almost fell through it once while traveling, as he recounted in his 1925 book "Sporting Days In Wild Norway": "The sleigh bells rang out merrily in the night air. The shining ice of Kröderen stretched before me into the darkness. Teeming stars looked down from above. And my thoughts tripped in time to the sleigh bells as I drove... The capital with its feverish gaiety lay far behind. I was bound once more for the freedom of the mountains. The dance music of the previous evening still echoed spasmodically through my brain. What a contrast! Along the shores of Kröderen Lake, at the foot of the shadowy hills, the lights of farms and cottages twinkled hospitably athwart the darkness. Ineffable peace. The course of life flows onward so safely, so serenely amid these silent slopes; but down there in the town... Crunch; the horse broke through some cat ice. I was startled out of my reverie to urge him forward, and drove on briskly towards Oldberg, sometimes over smooth ice, sometimes through more cat ice which splintered so that the pieces flew in showers… There were long stretches where I could drive on the river itself which was covered with smooth skating ice... Suddenly the horse’s foot went through the ice. A jerk of the reigns, and we were saved. It was as well to keep one’s eyes open, though, for there were treacherous holes, after the long thaw... Down on the river I could hear the swish and hum of skates on the ice, mingled with the shouts and laughter of skaters; they seemed to be enjoying themselves, for the darkness had not yet driven them indoors. I passed by a house, and heard the peremptory voice of the housewife call into the darkness: 'Well, aren't they coming?' And a girls voice replied in the Hallingdal dialect: 'Na-ay, I've screeched till I’m hoarse, but I cawn't mak' them hear.' In a flash I saw my own childhood before my eyes: when the ice lay smooth on the river and the lake it was no easy matter, I promise you, to make us come home to our lessons!" The sixth volume of the 1891 volume "American Notes And Queries" states that when Nansen went on his dangerous trek across Greenland's desolate interior, he used skates to cross some of the ice fields with his Norwegian and Lapp compatriots but I couldn't find a primary source to confirm that. If that WAS the case, it certainly hearkens back to the Eight Banner Ice Skating Battalion in China, doesn't it? Fittingly, in 1952, Fridtjof Nansen's grandson Eigel Nansen lit the Olympic flame at the Oslo Olympics in honor of his grandfather, a winter sports pioneer and legend in his country. It seems only fitting that a talented skiier, skating and infallible human being be recognized at a Winter Olympic Games in what was his home country. Although Nansen passed away suddenly in 1930, his memory lives on not only in that Olympic flame but in everything from mountains to islands to ski clubs to ships named in his honor around the world. Nansen not only touched Norway's history but WORLD history with his life's work and I thought a nod to his skating connection - even if it wasn't specifically a FIGURE skating connection - was absolutely appropriate. If you enjoyed this feature, be sure to always check back for skater interviews and writing about everything under the sun in the skating world. There is also a Facebook page connected to the blog where all blog articles and interviews are shared - as well as current skating news, photos and videos of amazing skating. Give it a "like" at http://www.facebook.com/SkateGuard. You can also follow me on the Twitter at http://twitter.com/SkateGuardBlog. I love talking figure skating and would love to talk about the sport with you! Q: You've had some incredible accomplishments thus far in your competitive career – you’re a two time Slovakian champion, represented your country at the Sochi Olympics and at the World, European and World Junior Championships and have won five medals internationally in the last few seasons. Reflecting on it all, what moments stand out as your proudest and which have been the most challenging? A: My figure skating career has been an incredible journey and I am very proud of how far I've come. I would have to say that the 2014 Sochi Olympic Games stand out, making it the proudest moment of my skating career as well as the most challenging. 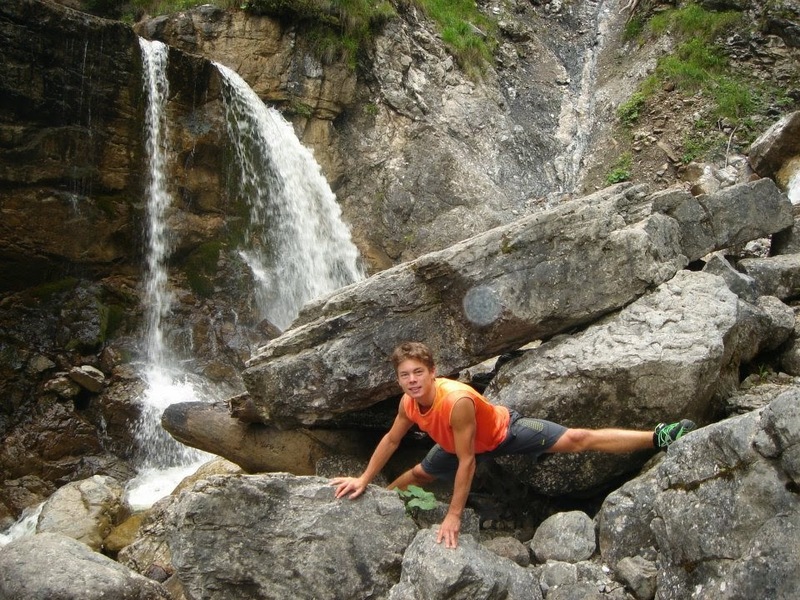 The journey to make the Slovak Olympic team was extremely difficult. Slovakia only had one spot so the 2013/2014 season was predominantly devoted to deciding which skater would go. In total, five competitions were heavily considered and I don't think I have ever skated with as much pressure and stress as I did in that season. Looking back, I am incredibly proud of the fact that I came out of this successfully, ultimately making the Slovak Olympic team. It was certainly a life changing experience and I learned a lot about myself. I am also very proud of how far I've come as a skater, and I hope to continue to improve. Q: You represent Slovakia as both of your parents were born there, but were actually born in New York City and currently train in New Jersey. How did you reach the decision to represent Slovakia as opposed to the U.S. and was it an easy process? A: Since I was born and raised in the United States, naturally I started competing in the United States. I qualified for the U.S. National Championships three times. In 2012, I won the Eastern Sectional Championships in the Junior level, which meant that I would be going to Nationals in a good position. However, after lots of thought and consideration, my family, coaches, and I decided that I should withdraw from U.S. Nationals and instead compete in the Slovak National Championships. At first, I was VERY torn between the two options because I felt that I was in a good position going into U.S. Nationals that year and I did not want to give that up. I was also scared to compete for a different country. However, we ultimately did decide that I would have many more opportunities if I skated for Slovakia because it was less competitive than the U.S. Although it was originally a difficult decision, I could not be happier that I chose to skate for Slovakia. I have had so many incredible experiences competing on the international circuit and I have made it to some places that I never would have had I continued to skate for the U,S. A: You've worked with some of the best in the business – Nikolai Morozov, Peter Johansson, Phillip Mills… What has each of the coaches and choreographers you have worked with over the years uniquely brought to your skating? A: I am extremely fortunate to have had the opportunity to work with all of these amazing coaches. They have all provided me with helpful guidance and advice that has stayed with me until today. I worked with Peter Johansson for two summers and he helped my jump technique. After working with him, my jumps became much more consistent. Additionally, he helped me maintain a level of inner discipline which helped me tremendously with my consistency. Phillip Mills choreographed my programs for the 2013/2014 season, and continued to help me mentally throughout the season. He helped me highlight my strengths while overshadowing my weaknesses. Additionally, he helped me remain mentally strong while fighting for the Olympics. 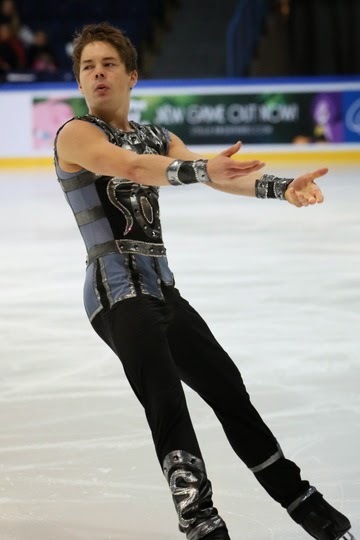 Nikolai Morozov choreographed my programs for the 2014/2015 season. We still have not totally decided for sure what I will skate to for either one of my programs but we are currently working on that. We are planning on experimenting with new styles and genres of music, so they will definitely be something to keep your eyes out for! Working with Nikolai is truly amazing – he is very creative, extremely fun to work with and has a unique style on the ice. He helped really enhance my artistic aspects of my skating. Q: What are your goals and plans for the 2015/2016 season and beyond when it comes to competitive skating and what would you say are your main focuses in training right now? A: For the 2015/2016 season, I really would like to improve the execution of my long program. In the 2014/2015 season, I consistently performed great short programs, however my long programs have always had a few flaws. Additionally, I hope to generally improve my skating skills and components. Beyond the upcoming season, I my main goal is to qualify for the 2018 Winter Olympic Games. Q: Of the skaters you competed against in Shanghai at the World Championships, who would you say is the toughest competitor? The most intimidating? The nicest person you could ever meet? A: I would say the toughest competitor is Elizaveta Tuktamysheva, primarily because of her consistency and perseverance throughout the past season. She performed incredibly well at numerous competitions and it seemed as though she did not let anything affect her. I don't really believe that anyone in particular is intimidating. I try to focus on myself at competitions and not let other skaters affect me. All of the skaters are very nice people! I do know Natalia Popova (of the Ukraine) very well, because we train together, and I have to say that she is probably one of the sweetest, nicest, most friendly and positive people I have ever met! Q: What are two things you absolutely can't travel without? A: I absolutely cannot travel without my Bose noise-cancelling headphones. They are absolute lifesavers on every flight. You can’t hear a single thing through them! I also always bring a good book and my number puzzles (Sudoku, Ken-Ken, Kakuro and such). I get bored super easily, so this always helps the time go by much faster. Q: What movie do you think you've watched the most times? What about a song or piece of music you've had on repeat more than once? A: One single movie doesn't really come to mind. I don't really have a favourite movie, but I love to watch anything new that will make me laugh. I'm really similar with music, but the song "Calling (Lose My Mind)" by Alesso and Sebastian Ingrosso featuring Ryan Tedder is my favourite. It always gets me in a good mood and never gets old! A: My three favourite skaters are Yuna Kim, Elizaveta Tuktamysheva and Yuzuru Hanyu. I really admire the entire package that Yuna Kim brings to the ice. Her grace, jumps, power and elegance are unmatched, and it was always a pleasure to watch her skate flawless programs wherever she competed. Elizaveta brings incredible consistency, confidence, and power to the ice. Her triple axel is amazing and extremely admirable. Yuzuru Hanyu seems as though he floats on the ice. His skating and jumps look so light and effortless. He always seems so focused, and I really admire how he executes his programs under any circumstance. Q: What's one thing about you most people don’t know? A: I am not sure that people know that in addition to being a skater, I am also a full time college student. I just finished my freshman year at the Gabelli School of Business at Fordham University. I am currently pursuing a Bachelor of Science in Global Business with a focus on Healthcare Management and Global Finance. I love math and science, and I want to incorporate this with my international experience. Q: What do you love more than anything about figure skating? A: When I am on the ice, I feel like I am in a world of my own. I am in complete control of my movements and I have a chance to get away from everyone and everything when I skate. My absolute favourite part of skating is the feeling I get after performing a good program at a competition. All of the training leads up to those few minutes I get to myself and when I skate well, nothing else in the world matches the happiness and satisfaction I feel. If you enjoyed the interview with Nicole, stay tuned to http://www.facebook.com/SkateGuard and http://skateguard1.blogspot.ca for more skater interviews as well as articles, commentary and special features! You can also follow me on the Twitter at http://twitter.com/SkateGuardBlog for skating tweets and whatever else I've got on the go. It would be rude not to! "Dreams do come true, if only we wish hard enough. You can have anything in life if you will sacrifice everything else for it." - J.M. Barrie, "Peter Pan"
Peter Pan made his first appearance in Scottish novelist and playwright J.M. Barrie's 1902 book "The Little White Bird", which was shortly thereafter adapted to a stage play and later expanded to the 1911 book "Peter And Wendy". Peter's adventures in Neverland have been translated to the silver screen in everything from a 1924 silent film to the 1953 animated Disney picture to Steven Spielberg's 1991 film "Hook". This autumn, Warner Brothers will release "Pan", yet another interpretation of the classic story sure to capture the imaginations of young and young at heart alike. Imagine my surprise when I learned that the character of Peter Pan was largely based on a skater. You read that right. That skater was in fact J.M. Barrie's own brother David. When J.M. Barrie was a boy of six, he and his brother David went skating outdoors two days before David's fourteenth birthday. Much like in the Regent's Park Skating Tragedy (another UK skating tragedy) the omnipresent dangers of skating on frozen water prevailed and David was killed when 'a friend' knocked him onto the ice while they skated and he fractured his skull on the ice. The death of David Barrie left his mother Margaret Ogilvy completely despondent. Of her children, she'd been particularly attached to David and to try to help his mother cope in her despair, J.M. (Jamie) Barrie would wear his deceased brother's clothing and even whistle like David. In an 1896 biographical account of his mother, Jamie recounted "She was always delicate from that hour, and for many months she was very ill. I peeped in many times at the door and then went to the stair and sat on it and sobbed." He remembered entering the room and hearing his mother say "is that you?" to which he responded "No, it's no' him, it's just me. Then I heard a cry, and my mother turned in bed, and though it was dark I knew that she was holding out her arms." Ogilvy apparently found great comfort in the fact that as David had died at thirteen, he would remain a boy forever, never to grow up and leave her. Piers Dudgeon, the author of the book "Captivated" speculated in the 2008 Herald Scotland article "Tragedy behind Neverland: did JM Barrie cause brother's death?" that J.M. Barrie may have been that 'friend' that knocked his brother down to the ice, which might explain some reason to his despondent mother's distance and rejection of him. Dudgeon said, "I was looking all the time for motivation. I found that in Barrie's childhood he had had this rejection from his mother due to the death of David. Everything seemed to come back to that skating accident. It is speculative. But it does add to the emotional picture of Barrie. A terrible guilt, associated with an accident in which your brother died, is something you would carry with you for the rest of your life. It would, perhaps, cut deep enough to unsettle someone." Dudgeon hypothesizes that if this were true, the experience would have shaped David Barrie as the model for the character Peter Pan, a boy who never grew old and for whom as J.M. Barrie wrote in his famous story "to die will be an awfully big adventure". A biography of J.M. Barrie written by The Peter Pan Moat Brae Trust, an organization dedicated to preserving his childhood home, states that "James tried very hard to replace his brother in his mother's affections, so much so that some people say he almost tried to become David. By a strange coincidence, at fourteen (the same age that David died) James stopped growing – and remained at a height of five feet for the rest of his life. 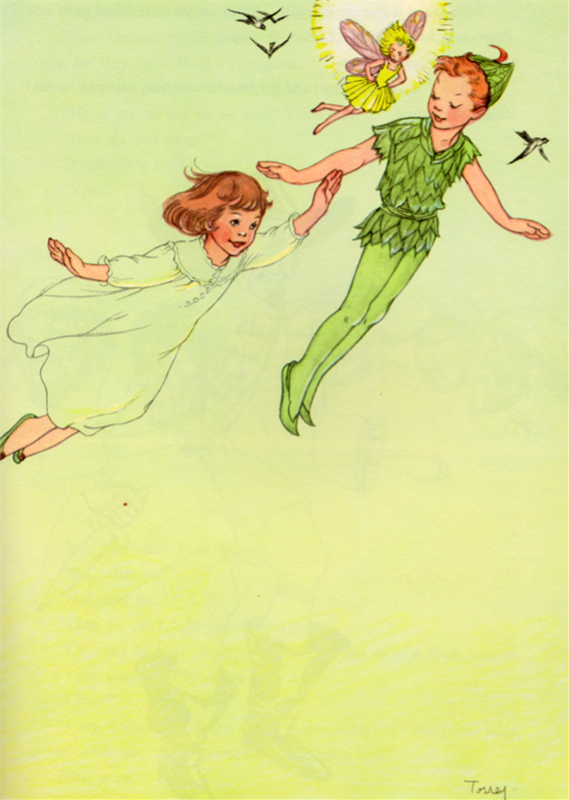 There is much debate about parallels of stunted growth and stunted emotional development (most ably dealt with in Andrew Birkin’s biography, J M Barrie and the Lost Boys: The Love Story that Gave Birth to Peter Pan)." How's that for life imitating life? However sad the stories of the survivors are in the case of the tragic death of David Barrie, it's incredible to think that his tragic death inspired the character of Peter Pan and has inspired generations of people around the world to dream big, live large and never grow old... and I think we can all agree that Barrie's words "Dreams do come true, if only we wish hard enough. You can have anything in life if you will sacrifice everything else for it" speak an important truth. Q: You're a two time Finnish Champion and represented your country on some of the world's biggest stages including the European Championships and World Junior Championships. You've also of course won medals internationally at events like the Nordic Games and Hellmut Seibt Memorial in Austria. Of everything you have accomplished so far as a competitive skater, what moments stand out as both the most special and the most difficult? A: I have had many special moments during my career, but three moments have been somehow the most special. The first one was Junior Worlds in 2005 where I skated the best programs of my life and made it to the top twenty. The competition was in Canada and it was already a big moment to make it there. The second was the first title in Senior Nationals. Before the first title, I landed five times in top three without being the best. So for me, it was a huge proof that I am on the right way in my career. The last moment was the short program in Europeans this year. It was my fourth Europeans and before that, I didn't ever make it to the final. I skated a really nice short program and it surprised me landing in top fifteen. The thing was also that my parents were for the first time watching me skating abroad. Somehow, everything was perfect there on that day. The most difficult moment was in 2010 when I went through a foot operation and had three months of rehabilitation. I also changed coaches at the same time and it was really difficult to get back to the track and start preparing for the next season. Q: You have trained both in Finland and in Germany. What can you share about your training regimen and current goals? A: At the moment I'm practicing in Oberstdorf, which is one of the best places in Europe for figure skating. We have ice from eight in the morning until ten in the evening. For me, it makes it possible to combine my medicine studies with practice so that I'm getting progress in both. At the moment, my biggest goal is the 2017 Worlds in Finland. There, it would also be possible to get place for Finland in the 2018 Olympics. Q: You started skating when you were five and are now twenty seven. What has kept you passionate about the sport and interested all of these things? A: I really like all kinds of sports. It's more like a way of life. Of course when you are practicing three to five hours a day, you expect some progress. The last few seasons have been really good and I have showed everybody and especially me that it is still possible to get better in this age. Q: Describe the ultimate day in your life. What would you eat, what music would you be listening to and where would you go? A: I really like nature and all kinds of fish. So on my ultimate day, I would be hiking in the mountains with my fiancée and listening to the sounds of nature and eating fresh fish from the lake or river. Q: How do you think figure skating needs to change or grow to become more popular with the wider audiences of today and draw in more fans? A: I wish I had an answer for this question. In many aspects, figure skating is still really conservative and there should be something done to make it more modern and interesting for everybody. Q: If you could recommend one book that EVERYONE needs to read, what would it be and why? A: I don't really read any books other than medical books, so I would recommend human's anatomy books for everybody to get a better understanding how complicated we actually are. 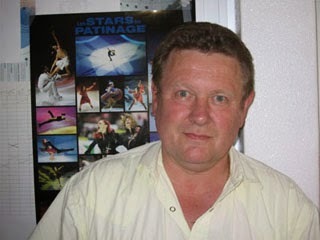 A: Alexei Yagudin was my favourite skater when I was a kid. 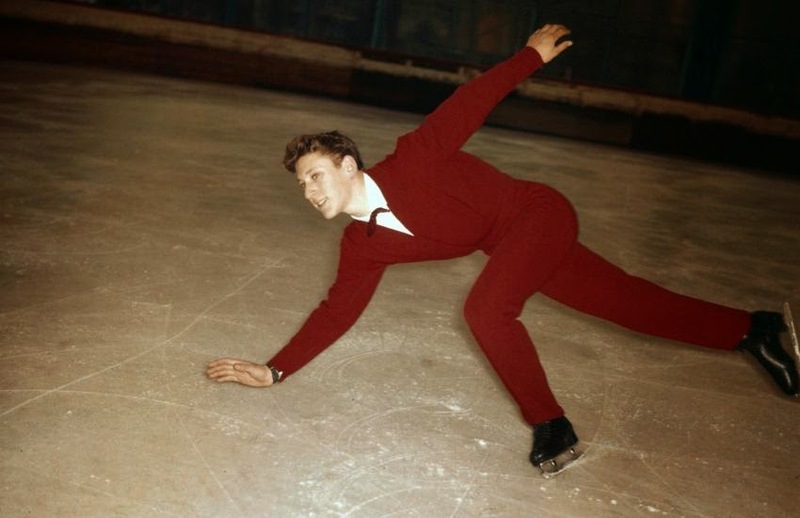 His skating was really masculine and strong which impressed me back that time. Later, I saw old videos from Kurt Browning and he impressed me with his amazing skating skills. But... Daisuke Takahashi had everything what makes you special in figure skating. 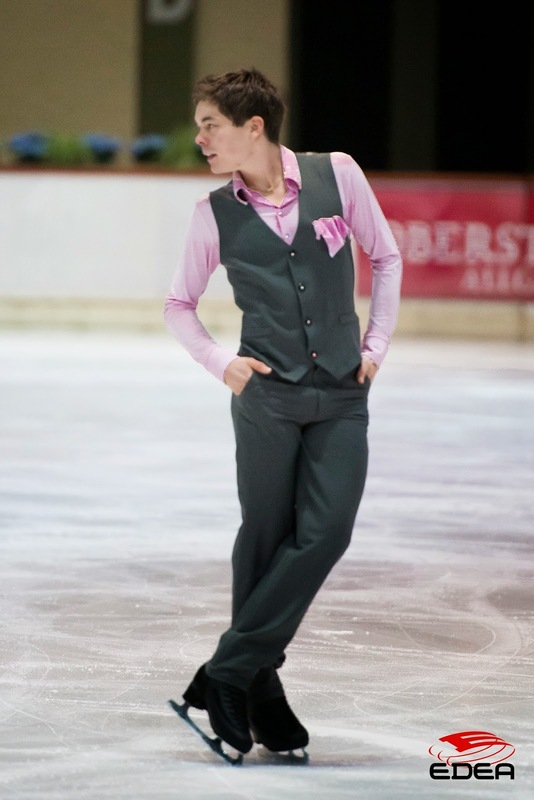 Especially in the days when his quads were working, it was just a pleasure to watch his skating. A: I think most of the people who don't know me well don't know that I'll be a doctor by Christmas. Q: What is the biggest lesson figure skating has taught you in life? A: Sport is just sport. If you enjoyed this interview with Valtter, the best advice I can give you is to take just a moment of your time and click through to this blog's Facebook page at http://www.facebook.com/SkateGuard and "like it" - you'll end up with daily figure skating news, videos and interesting articles right in your Facebook news feed, as well as new content and interviews on this blog as they happen. I'm also just in love with the Twitter - it's so fun! You can tweet me at http://twitter.com/SkateGuardBlog anytime you feel like talking about skating. Change doesn't happen unless people MAKE it happen and figure skating owes a certain debt to Madge Syers, the first woman to glide out on the ice at the World Championships and give the men a run for their money. In doing so, Syers set a ball in motion that afforded women the right to compete... and assured her own place in the record books as the sport's first female Olympic Gold Medallist. Minnesota's Mabel Davidson, whose fascinating story of travelling to London and Paris via Canada to give skating exhibitions with her bicycle in the late nineteenth century, remains one of my favourite 'finds' to date. However, the story of how women became accepted to a sport that was once an old boy's club is full of fascinating figures and facts, and I wanted to share some more of these people's stories with you. One woman's story the history books DON'T mention gives you a clear picture of just how controversial females taking on a male dominated really was back in the days before women's rights and suffragettes were 'a thing'... and be warned, the next part isn't exactly a happy story. In the northeastern Alsatian area of France lies a town called Colmar that was founded in the ninth century. In 1851, a German woman living in Colmar named Maria Weigel decided to join her male counterparts ice skating and got a pretty icy reception. In fact, she was STONED by her own neighbors and barely escaped with her life, coming home with a bleeding head. Class may have played an inportant role in Weigel's cruel treatment at the hands of the townsfolk. Weigel was the daughter of a court physician, so she wasn't exactly a peasant, but she wasn't nobility either. In contrast, Henriette Sontag was an opera soprano married to an Italian count had skated publicly in the 1820's in Austria and 1840's in Germany and she certainly didn't get hailed with stones by spectators. Her class level perhaps would have afforded her a certain level of freedom to do as she wished. After all, we know that back in 1776, Marie Antoinette skated in Napoleonic France when she wasn't busy saying "let them eat cake" to French peasants. 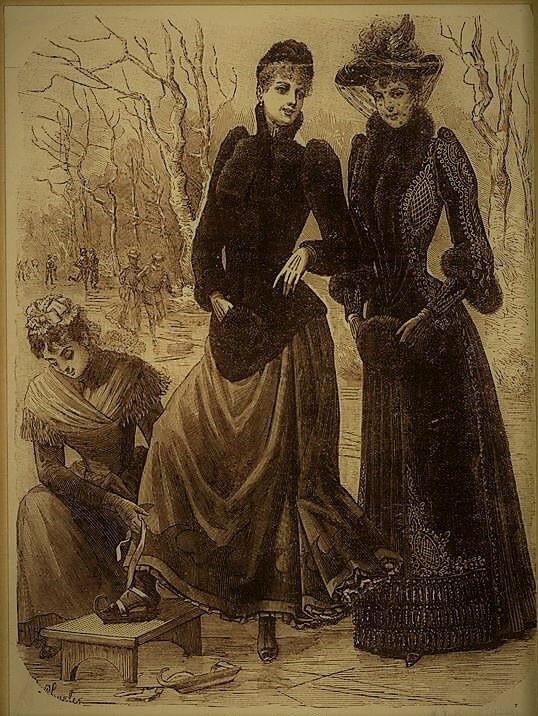 By the 1860's, skating was becoming more culturally popular in Vienna, owing to (according to Mary Louise Adams' wonderful book "Artistic Impressions: Figure Skating, Masculinity And The Limits Of Sport") an Austrian actress named Auguste Willibrandt-Baudius who "not only skated with men in public but sometimes did so in trousers". 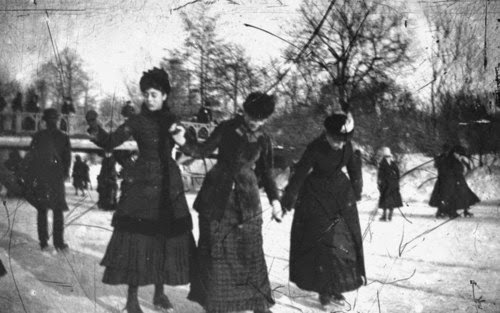 Meanwhile in Canada, the Montreal Skating Club began accepting female members in 1860 although they had held elaborate ice balls and carnivals prior to that with female skaters included. "1. Avoid skates which are strapped on the feet, as they prevent the circulation, and the foot becomes frozen before the skater is aware of it, because the tight strapping benumbs the foot and deprives it of feeling. 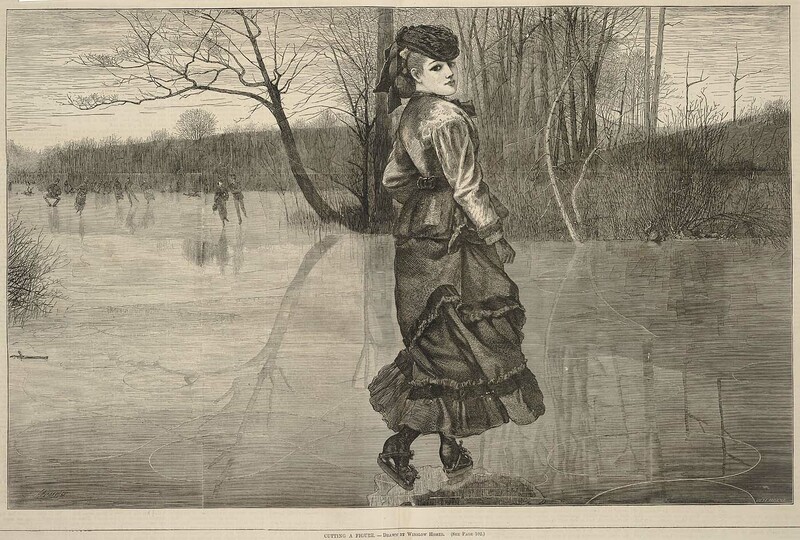 A young lady at Boston lost a foot in this way; another in New York her life, by endeavouring to thaw her feet in warm water after taking off her skates. The safest kind are those which receive the forepart of the foot in a kind of toe, and stout leather around the heel, buckling in front of the ankle only, thus keeping the heel in place without spikes or screws, and aiding greatly in supporting the ankle. 2. It is not the object so much to skate fast, as to skate gracefully; and this is sooner and more easily learned by skating with deliberation; while it prevents overheating, and diminishes the chances of taking cold by cooling off too soon afterward. 3. If the wind is blowing, a veil should be worn over the face, at least of ladies and children: otherwise fatal inflammation of the lungs, "pneumonia," may take place. 4. Do not sit down to rest a single half minute; nor stand still, if there is any wind; nor stop a moment after the skates are taken off; but walk about, so as to restore the circulation about the feet and toes, and to prevent being chilled. 5. It is safer to walk home than to ride; the latter is almost certain to give a cold. 6. It would be a safe rule for no child or lady to be on skates longer than an hour at a time. 7. The grace, exercise, and healthfulness of skating on the ice can be had, without any of its dangers, by the use of skates with rollers attached, on common floors; better, if covered with oil-cloth." 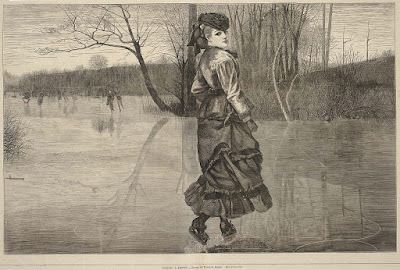 In 1870, members of London's Skating Club allowed a restricted number of women (twenty) to hold membership on its new skating club on the flooded archery pitch in Regent's Park. Based on the horrible tragedy that had happened there only three years earlier, I'd thought apprehension about numbers period might have played a role in the number of skaters accepted into the club, but the Club had no problem accepting a disproportionate number of men's memberships: one hundred and twenty. Restrained sexism was still in full swing in Jolly Ol' England. 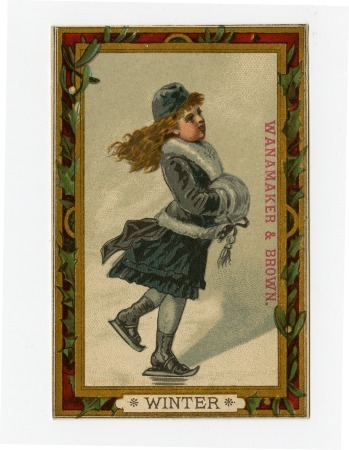 Trade card of woman skating, circa 1880. Photo courtesy Historical Society Of Pennsylvania. Meanwhile on the continent, by 1875, Viennese skating club Weiner Eislaufverein was holding a women's only competition. In 1885, according to Allen Guttmann's "Women's Sports: A History", "one of the earliest club-sponsored races for female ice-skaters was held in Hamburg". This didn't stop women from being ridiculed for their decision to pursue athletic endeavours. Guttmann points out that "in France and Germany as in Great Britain and the United States, there was acrimonious debate between those who welcomed the prospect of women's sports and those who feared that female athletes jeopardized their anatomical destiny as wives and mothers. In the Revue des Revues for July 1900, the poet Rene Francois Armand Sully-Prudhomme expressed his 'horreur' at the athletic woman's tendency to 'borrow from men the virile qualities that denature her and negate her charm.' The novelist and intrepid political activist Emile Zola strongly disagreed. He was receptive to 'whatever physical exercises can contribute to woman's development - as long as she doesn't abuse them.' Zola denounced the tyranny of received opinion and refuted the argument that sports masculinize the female athlete." "Cutting A Figure" by Winslow Homer. Photo courtesy Smithsonian American Art Museum. We also know that the segregation of the sexes and discouragement of women in skating wasn't an "everywhere" thing. Accounts of female settlers skating in The New World predated Weigel's unfortunate attack by almost two centuries, as referenced in Charles Wooley's 1678 account of Dutch settlers in America: "And upon the Ice its admirable to see Men and Women as it were flying upon their Skates from place to place, with Markets upon their Heads and Backs." Of course, Lidwina, The Patron Skate Of Ice Skating had them all beat... she'd been out there doing her thing back in the fourteenth century... before it was cool! All of these examples of female skaters who'd been out on the ice before Weigel aside, I think the story of her absolutely disgusting treatment at the hands of her French neighbours drives home an important message to all skating fans. If you look people like Madge Syers or even in their own respects... skaters like Mabel Fairbanks (who pushed the color barrier), Rudy Galindo (an openly gay man who won a national title in a country that still has people who think people like Sarah Palin make any logical sense) and Toller Cranston (who pushed the boundaries of artistry in the sport), there are always going to be people resisting equality and change in the sport of figure skating just as there are "in real life". After all, it's 2015 and it's still called 'ladies' figure skating. How's that for outdated? Travelling across the Atlantic Ocean carried by the churning waves of the divide that is the Atlantic Ocean, settlers of 'The New World' embarked on the ultimate adventure of a lifetime when they crossed the troubled water and ventured into the unknown to forge new lives in a foreign and at times unforgiving new land. In the decades following the historic landing of the Mayflower in Plymouth in 1620, tens of thousands of settlers from Britain, Holland, France and even Sweden colonized North America and they wasted no time breaking out their skates and venturing out into the ice to break the monotony of the long winters; at least the Dutch didn't. In Holland, skating was not only hugely popular but an activity considered culturally acceptable for people of all classes. Early colonists of North America from Holland brought with them their skates and were the first to pioneer skating in what is now the United States. 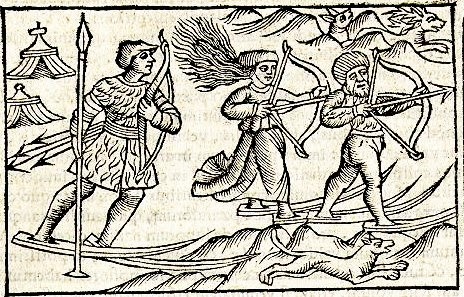 In 1678, English clergyman Charles Wooley wrote: "And upon the Ice its admirable to see Men and Women as it were flying upon their Skates from place to place, with Markets upon their Heads and Backs." This account evidences that skating was not only used for pleasure but as a means of transportation and moving goods from place to place. 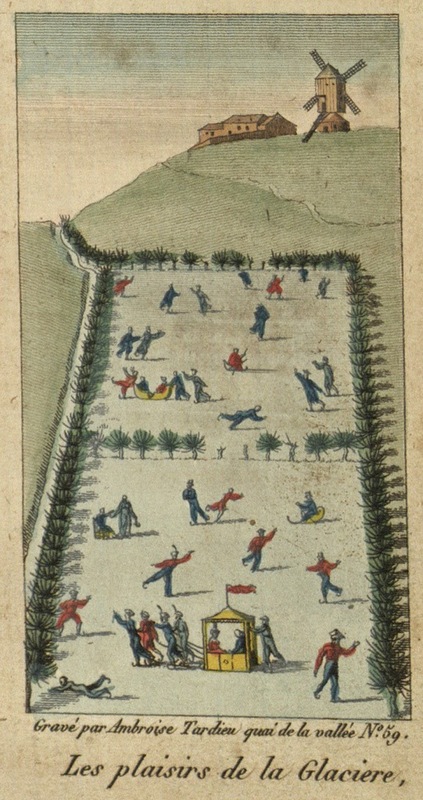 While the Dutch were carrying on the tradition of the patron saint of ice skating Saint Lidwina in a whole new setting, it would be the French settlers who were first credited with bringing skating to settlements in New France in the early 1600's, right here in Nova Scotia. Interestingly, if you look at the early history of skating in New France and Canada, you see that the Iroquois people used bone skates to transport themselves across frozen ponds, lakes and rivers long before the French settlers at the Acadian settlement of Port Royal would have. Barbara Schrodt of Canadian Encyclopedia confirms this: "according to legends, the Iroquois used to skate, tying animal shinbones to their footwear with leather thongs." There were several tribes in the area at the same time of New York's colonization including the Mohawks, Lenapi tribe and... the Iroquois. Based on the fact that we already know that the Iroquois people used bone skates for transportation in what is now Canada, it is probable that they did just the same in what is now the United States as well. In fact, many bone and shoe combinations unearthed by archaeologists suggest that the Iroquois people had been skating for some time. Skating continued to gain in popularity not only as a form of transportation but as a recreational activity in Colonial America over the coming century. In 1811, Pennsylvania born lawyer and Revolutionary Army Captain Alexander Graydon wrote in his memoirs "With respect to skating, though the Philadelphians have never reduced it to rules like the Londoners, nor connected it with their business like Dutchmen, I will yet hazard the opinion, that they were the best and most elegant skaters in the world. I have seen New England skaters, Old England skaters, & Holland skaters, but the best of them could but make 'the judicious grieve.' I was once slightly acquainted with a worthy gentleman, the quondam member of a skating club in London, and it must be admitted, that he performed very well for an Englishman. His High Dutch, or, as he better termed it, his outer edge skating, might, for aught I know, have been exactly conformable to the statutes of this institution: To these he would often appeal; and I recollect the principal one was, that each stroke should describe an exact semicircle. Nevertheless, his style was what we should deem a very bad one. An utter stranger to the beauty of bringing forward the suspended foot towards the middle of the stroke, and boldly advancing it before the other, at the conclusion of it, thus to preserve, throughout his course, a continuity of movement, to rise like an ascending wave to its acme, then, gracefully like a descending one, to glide into the succeeding stroke without effort, either real or apparent—every change of foot with this gentleman seemed a beginning of motion, & required a most unseemingly jerk of the body; an unequivocal evidence of the want of that power, which depends upon a just balance, & should never be lost—which carries the skater forward with energy without exertion; and is as essential to his swift and graceful career, as is a good head of water to the velocity of a mill wheel. Those who have seen good skating will comprehend what I mean, still better those who are adepts themselves; but excellence in the art can never be gained by geometrical rules. The two reputed best skaters of my day were General Cadwallader, and Massey the biscuitbaker; but I could name many others, both of the academy and Quaker school, who were in no degree inferior to them; whose action and attitudes were equally graceful." In the decades to come, the first skating club in America, the Philadelphia Skating Club, would be formed in 1849. In 1861, it would become the Philadelphia Skating Club and Humane Society. As all of the skating would be done outdoors, members were required to carry wooden reels attached to their left wrist containing a length of strong rope and were instructed on how to resuscitate a drowning victim. Two years after the Philadelphia Skating Club became the Philadelphia Skating Club and Humane Society, the Skating Club Of New York would be established. Although their would be no unifying or governing body of skating in the U.S. until 1886, races and skating competitions would be held under the rules of the clubs playing host to these events. One such event would be the Championships Of America which were first held in Troy, New York in 1863 and won the first two years by the legendary Jackson Haines. Other winners of these Championships Of America would include W.H. Bishop, E.T. Goodrich and Callie Curtis (who won the event a record ten consecutive times from 1870 to 1879). More on Callie Curtis later! Looking back though and reflecting on the quote by Wilma Mankiller I shared at the beginning of this blog, it's so compelling to me to think that skating's roots in Colonial America traced not only to the Dutch but to the Iroquois people. Considering how little we truly know about the history of North America prior to colonization, one has to wonder just how many centuries the people whose homeland many American's ancestors decided to make themselves right at home in had been skating for. As patrons of the art of skating in North America, we truly do owe our gratitude to the first people who skated on our land. A big thanks to reference librarian Jeanna with Halifax Public Libraries for her help in locating research material for this blog! If you enjoyed reading, give this blog a like on Facebook at http://www.facebook.com/SkateGuard or give me a follow on the Twitter at https://twitter.com/ohh_N. If you enjoy hearing about skating, you've come to the right place.